In 1389 the Munster Geraldines began building a friary for the Conventual Franciscans. It was completed around 1420. 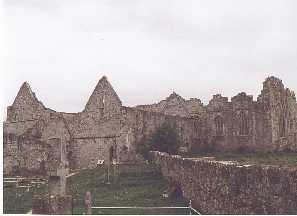 By 1490, the friary was occupied by the Observantine Franciscans. 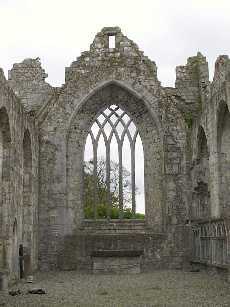 The friary was built with dark grey limestone, which can be found in the locality. The founder is believed to be Gerald, the fourth Earl of Desmond. 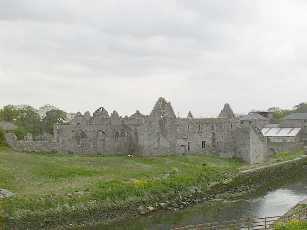 A chapter of the Franciscans was held at the friary in 1564. In 1579, the English commander Malby laid siege to the castle in Askeaton. Due to his failure in overthrowing the castle, Malby set fire to the town and the friary, killing a number of friars in the fire. It was not until 1627 that friars returned to the friary but they did not re-establish themselves fully until 1642, when the Confederates took control of the town. The friars then began to restore and repair the friary. During this time the bodies of two Franciscans who were hanged in Kilmallock in 1579 were buried in the friary. They were Patrick O'Hely, who was the Bishop of Mayo and Conn O'Rourke. Also, a Fr. O'Farrell was hanged in the friary. With the Cromwellian invasion of 1648, the friars fled the friary and went into hiding or travelled abroad. The last Guardian to the Friary to reside at the friary was appointed in 1714, although they were still nominated until 1870. Part of the friary was used as a church until the new church was built in the town in 1851. The nave and chancel of the church still remain along with the north transept. Also the window in the north wall remains intact. In the friary, there is a tomb to Richard Stephenson, who was a leading member of the Confederate Irish Forces. Stephenson died in 1646 and the inscription to him is written in Latin. Part of the inscription is missing on the tomb. His family is said to have expelled the monks form the friary for a second time in 1651 or 1691. The friary is a very impressive building and recently it has been restored by FAS workers, who have made the friary accessible to tourists. Two chalices were found in the grounds of the friary. One of these dates from 1662 and is now kept in St. Mary's church. The De Lacy family of Conigar, Askeaton, commissioned the chalice. There were two tombs in the friary to the Earl of Desmond and Turlough Mac Mahon but Malby and his forces destroyed both in 1579. Begley states that there was a chalice in Askeaton that was still being used in the 1920s. The chalice was made in 1719 by Fr Pat Purcel and belonged to the Franciscans at the friary there at one stage.